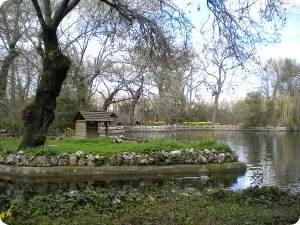 The "Parque El Capricho" or Caprice Park (literally, a whim) is still quite unknown even to Madrid's inhabitants. Maybe because it is not in the center of the city and it only opens on weekends. 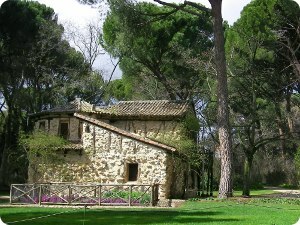 It is located at the Alameda de Osuna. 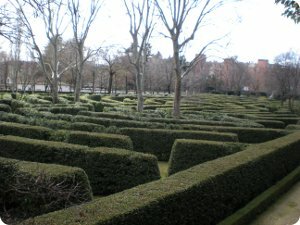 The 14-hectare garden, located in the area of Barajas district, dates back to 1784 when the Duke of Osuna, from one of the most illustrious and powerful of the city's families, acquired the land for the specific purpose of giving expression to the family's visionary and artistic values as well as to give the family a place to escape city life. During the Civil War a change came about, since what was once considered a place for leisure and strolling, became the Staff Headquarters of the Central Army. To this day, the garden shows the structural accommodations for a line of defence bunkers. At the end of the war, the property passed through a number of different hands, until it was bought by the Town Hall in 1974, followed by renovation works carried out several years later. After several periods of inactivity, this work as finally taken up again in 1999, and went on to win a Europa Nostra award in 2001. On the way to the estate, one passes a circular plaza which used to be the site of a bull-fighting ring and which later became the Paseo de los Duelistas, with two sculptures representing the distance separating two people about to engage in a duel unto death. A little further is the Plaza de los Emperadores, showing the busts of two Roman emperors along with the Exedra, which is a semi circular building in the classical style, and from which one then proceeds into the Palace's front gardens. There is a labyrinth which is expressly designed for playful hiding or amorous frolicking, is a laurel grove set as per the original wishes of the Duchess herself. The rest of the park gardens is a typical English landscaped garden, echoing the natural forms of nature, most inviting for a stroll and finding a quiet corner. There are many love trees, elms, almond trees, Holm oaks and lilac bushes, which contribute their colours in springtime. As for the Palace itself, only the walls are left from the original building, rising three floors and finished off at each corner with towers. The inside has been remodelled, and houses the offices for the park services. There is a grand ballroom, dining salons, a 6,000 volume library, as well as the alcoves and chambers of the family members. Not far from the palace is the Temple of Bacchus, which is a classical style garden structure with an oval floor base, surrounded by twelve Ionic columns and set on a rise, making it a romantic view from other parts of the garden. Water is present throughout the walk. A sinuous stream goes makes its way across the property, deep enough for row boats and in fact, uniting the games area and the lake with the Dance Casino, which can be reached by a small wharf called the Casa de Cañas.